Pay the driver as you board the bus. Let us pick you up. Our regular route stops within a close distance to most hotels and campgrounds in Cody. See pick-up schedule for times and pick-up locations. Cody, Wyoming, the Rodeo Capitol of the World. 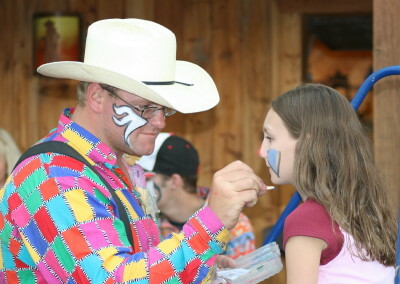 Cody hosts the famous Cody Nite Rodeo every night from June 1st through Septembet 1st, as well as the Buffalo Bill Cody PRCA Stampede Rodeo every July 1st through 4th. The Xtreme Bulls bull riding event will be June 30th. See the pick-up schedules for all these rodeo events. For over 20 years, we've run the only transportation to the Cody Nite Rodeo. Hop aboard and enjoy your ride through the town of Cody to Stampede Park. We'll show you points of interest along the way. Our drivers don't sell admission tickets to the rodeo. Purchase your tickets for the Cody Nite Rodeo on-line, at the gate or at one of the many ticket vendors around town. Buy your tickets in advance for the Stampede Rodeo on July 1st through the 4th, and for Xtreme Bulls on June 30th. These often sell out and are sold for assigned seating.